SystemWare Europe has supplied products and services to the UK and European MoD and government arena for over 18 years. This includes sale and support of innovative dynamic solutions for Technical Surveillance Countermeasures and Mobile Network Counter Surveillance. At this year’s exhibition we will be demonstrating Spectrum Guard Pro, our latest leading-edge RF Signal Collection and Analysis solution capable of ultra-fast scanning along with extensive real time analysis. SG Pro also offers simultaneous real time wireless detection, collection and analysis of 802.11, Bluetooth and ZigBee protocols. Our products offer compact, remotely controllable RF signal detection from 1kHz to 26.5GHz delivering cutting edge capability and performance. Scalable software allows for specific tailoring to meet customer requirements. We will also be exhibiting a range of other security products on the stand including PRISM, a small unit combining five different receivers to capture wireless signals. PRISM can be used with our legacy products. Spectrum Guard Pro combines hardware and software into a portable Radio Frequency (RF) detection and monitoring system that is small, lightweight, and easy to use. Operating between 1kHz and 26.5GHz and scanning up to 100GHz/sec, it combines selectivity, sensitivity and extensive real time analysis to provide a very capable proficient system. Spectrum Guard Pro also offers simultaneous real time wireless detection, collection and analysis of 802.11, Bluetooth and ZigBee protocols. With real time analysis including modulation classification, sub carrier detection and video reconstitution, users can identify, analyse and confirm signals of interest. Supporting use of a Port Switch and Power Line Antenna, Spectrum Guard Pro can simultaneously sweep multiple antennas in addition to sweeping mains lines. With a dynamically adjustable sensitivity threshold and user definable limits, any signals of interest are displayed in multiple easy to read formats. These include 2D,3D and waterfall visual representation which can all be zoomed and manipulated to maximise signal detail. Users can also save and analyse IF data as well as creating their own signal fingerprints for bespoke modulation types. The software application interface is accessible by users with minimal RF knowledge, but also provides the tools an experienced operator needs to accomplish the mission. 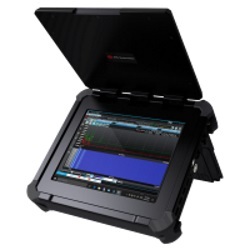 Spectrum Guard Pro is intended to be used by security professionals for RF signals collection and analysis in support of static or mobile operations. With multiple receivers it is ideal for use to evaluate the RF Spectrum, Wi-Fi and cellular spectrum for unauthorized transmissions.